During the 1950s and 1960s, Stockholm was growing so fast that the space in the original city, within the old customs points, wasn't enough. New districts sprang up outside the original city limits, and the underground was extended out to the new suburbs to tie the city together. As part of the so-called "miljonprogrammet" ("Million Programme"), under which one million new units of housing were to be built in ten years, Svenska Bostäder (a housing company owned by the City of Stockholm) constructed a "modern" concrete city on a mountain called Nybohov. At about the same time, in 1964, system 2 of the underground was extended to Fruängen via Liljeholmen. To provide a convenient means of transport up the steep Nybohov hill, an inclined elevator line was built to connect the Liljeholmen underground station with Nybohov. At 13.00 on 5 April 1964 the line was placed in service. Internally it was called line 200. The fare was 30 öre one way, and so each car had a conductor. On 1 February the fare was abolished, as were the conductors. The line runs mostly in rock tunnel, but the uppermost ten meters or so are in a cast concrete tunnel under an apartment building. The line is 230 meters long and has a vertical rise of 37 meters. 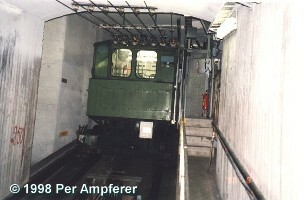 The engine is placed in a cellar at the upper station. It runs on 220 V DC and uses a transmission to drive the cable. The car is powered by overhead wire in the tunnel, similar to what trams use; this wire feeds power to the car for lighting and other electrical equipment. 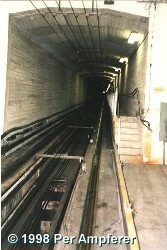 There is a platform along the entire line so that the tunnel can be evacuated in an emergency. The two stations have automatic doors. If the line is out of service, substitute bus service is provided by line 131 up Nybohov hill, but at the stops the signs say (H). 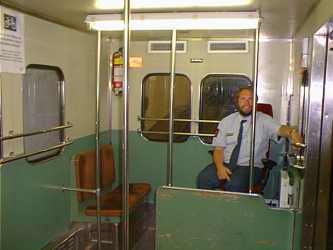 The car interior is similar to a Stockholm underground car of type C4. The car has a capacity of 40 passengers, 4 seated and 36 standing. The ride is quite comfortable because the car rolls on rubber wheels running on metal surfaces. From the car, cables run around a wheel in the line's upper station, and back down to a counterweight that rolls between the car's paths. In this way, the car and the counterweight meet at the line's halfway point. The line is fully automatic, but a guard works on the car to keep order. © Text och photo: Bruse LF Persson. © Photo: Per Ampferer and Micke Asklander. All photographs taken in 1998.